Info "I KNOW they'll drop those..."
Pencil Pinch is a downloadable microgame in WarioWare: D.I.Y. and WarioWare: D.I.Y. Showcase. It was released on August 12, 2009 in Japan, July 12, 2010 in North America, and August 13, 2010 in Europe. 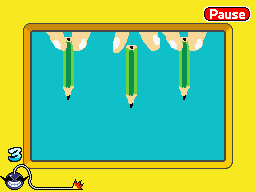 At the start of the game, three hands at the top of the screen are holding pencils - occasionally, one of them holds a worm instead. The pencils can either be long or short. After a few seconds, one of the pencils is dropped. The player has to tap the falling pencil to stop if from falling and, therefore, win the game. The words "NICE CATCH!" appear on the screen in red if the player manages to catch it; if they don't, the game is lost. This page was last edited on October 9, 2018, at 00:31.